The Avg. Group Saves 6.3%! 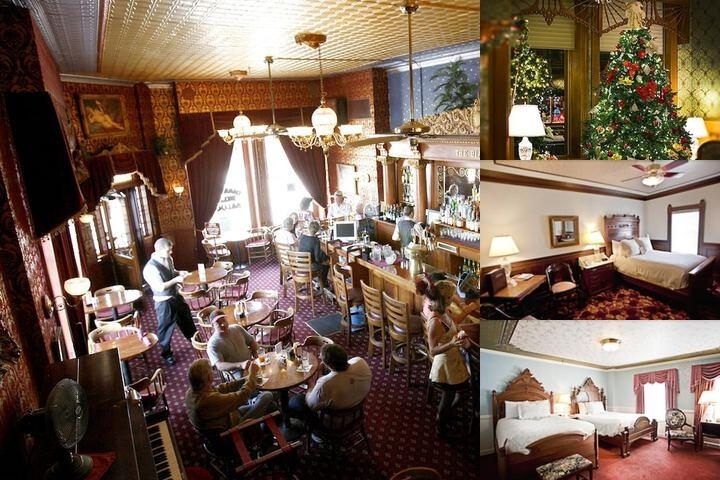 The Strater Hotel has graced Durango's Main Avenue since 1887. 93 unique and impeccable guestrooms each with Victorian Antiques. Enjoy our exceptional dinner restaurant, the Mahogany Grille which features New American Cuisine. 2 bars on site including the famous Dianmond Belle Saloon with saloon girls in costume and live music every night. Deluxe continental breakfast included in rate. Groups are our specialty! Hotel Features: The Historic Strater Hotel is home to the largest collection of Victorian antiques in the world, which can be found throughout the hotel. You will also find two of the best restaurants and bars in the West - the Diamond Belle Saloon and the Office Spiritorium. The hotel also features the Mahogany Grille Restaurant, and the famous Henry Strater Theater, where you can take in a performance of the Durango Melodrama. Guest Rooms: The Historic Strater Hotel Features 93 guest rooms which are divided into three categories: Classic, Deluxe, and Premium. In each of the uniquely-appointed guest rooms, you will find a collection of valuable Victorian antiques, televisions, comfortable bathrooms, and some rooms even boast separate sitting areas. Nearby Attractions: While staying at the Historic Strater Hotel, you'll enjoy the close proximity to many of Durango's site and attractions. Nearby points of interest include the Durango and Silverton Narrow Gauge Railroad Museum, the Animas Museum, the San Juan Sky Outfitters, and the Mesa Verde National Park. Amenities : At the Historic Strater Hotel, you will find a number of amenities. Plan your Durango experience with the help of the friendly concierge. Enjoy gourmet meals at the first-class restaurants. Sip your favorite libations while meeting new friends at the hotel bars. 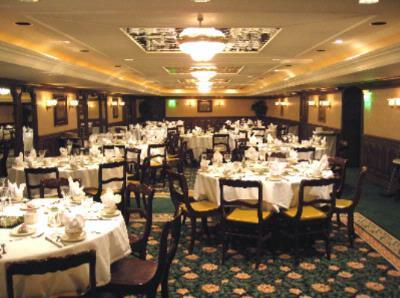 The hotel also offers banquet services for hosting memorable private affairs. -People who want to be a part of the living history of Durango. -Those who want to be close to live entertainment. -Individuals who want to experience gourmet dining right within the comfort of their Durango hotel. Expert Tip : Take advantage of one of the Historic Strater Hotel's Stay and Play Packages, which allow you to enjoy activities, attractions and hotel accommodations for one price. Group cancellation must occur 90 days before arrival. Individual cancellations must be 24 hours before arrival. 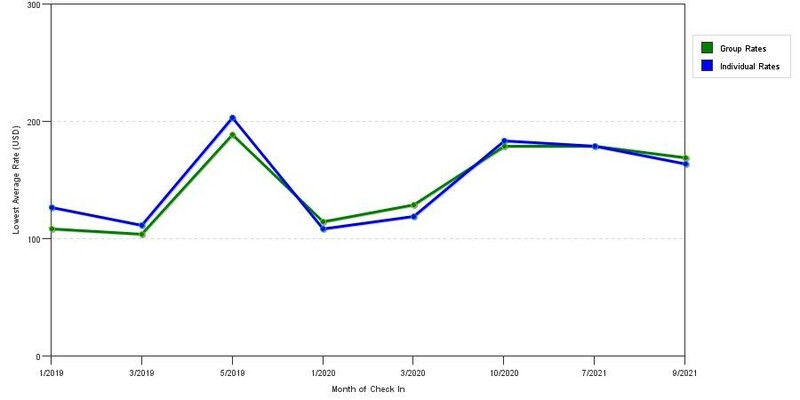 The chart above shows averages of prices for both our group rates and the best individual traveler rates our rate checker could find at the time the group bid was placed. The best group rate shown is 29.5% in October 2018 and the highest average individual rate is $217 in the month of July 2018. This chart will show past seasonality and also project future months. If you are flexible with dates, you may want to consider staying at Strater Hotel in a month when rates are lower. 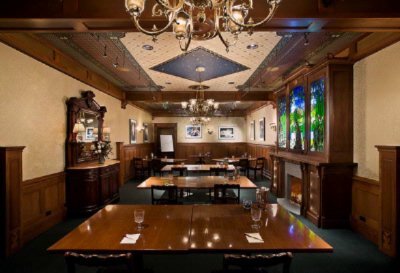 Below are the meeting, banquet, conference and event spaces at Strater Hotel. Feel free to use the Strater Hotel meeting space capacities chart below to help in your event planning. Hotel Planner specializes in Durango event planning for sleeping rooms and meeting space for corporate events, weddings, parties, conventions, negotiated rates and trade shows. Make your event part of history! The Pullman Room is lavishly appointed with mahogany wainscotting, picture boxes filled with antiques and crystal chandlaliers. 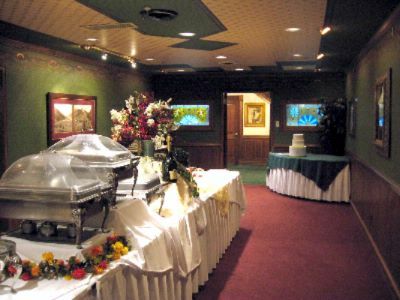 Full service food and beverage options are available through the Strater Hotel's company, 1887 Catering. John F. Kennedy gave a campaign address in the Pullman Room in 1960. 81 x 21 x 7 Ft. Luxury meets functionality in the Centennial Room at the Strater Hotel. Ideal for small meetings and meals. The Centennial room features mahogany wainscotting, authentic turn of the century photographs and stained glass and picture boxes filled with antiques. Food service is available through Strater Hotel's catering company, 1887 Catering. Make your event part of history! 47 x 13 x 7 Ft. The Oak Room is the Strater Hotel's premier event venue featuring mahogany wainscotting, antique stained glass and a working fireplace. Food service is available through the Strater Hotel's catering company, 1887 Catering. Make your event part of history! 44 x 16 x 12 Ft.
51 x 46 x 144 Ft.
44 x 16 x 144 Ft.
81 x 21 x 90 Ft.
38 x 13 x 90 Ft.